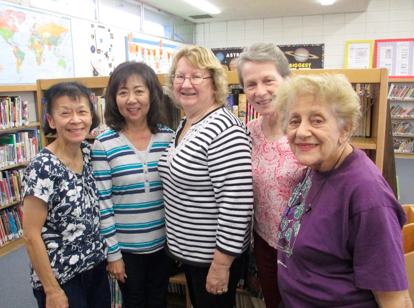 Our volunteers included Candy Yee, Elayne Shiohama, Joan Pylman, Sally Lopez, Gloria Ampolilla and camera shy Joanne Witt, Mabel Low. As the students of the Artesia Cerritos area prepare to go back to school for the 2016-2017 school year, so does the Magnificent 7 members of WCAC start preparing for the year as Tutors at the Artesia Library Homework Center. Since 2002 we have been partnering with the Artesia Library to provide after school tutoring once a week for children in grades one through six. The Woman’s Club volunteers on Wednesday from 3:00 pm to 5:00 pm. Students are helped in the content area of language arts (spelling, word pronunciation, etc), reading comprehension, math, social sciences and science. The project has been supported monetarily for the last three years by WCAC. The funds are used for supplies such as crayons, pencils, erasers, graft papers, etc. Four times a year the tutors gather treats and small gifts to give to the children for rewards and incentives. Four of our seven tutors are retired teachers. In 2015 we had 33 tutoring sessions, with a total of 266 hours. Total number of Children assisted 478. One of the parents of one of our students said her son received honors at a school ceremony and credits his coming to the Homework Center for his much improved school work. She said that her son now does his homework right away instead of putting it off. So if you are interested in helping us or the Homework Center, please contact Barbara Nightingale at the Library.